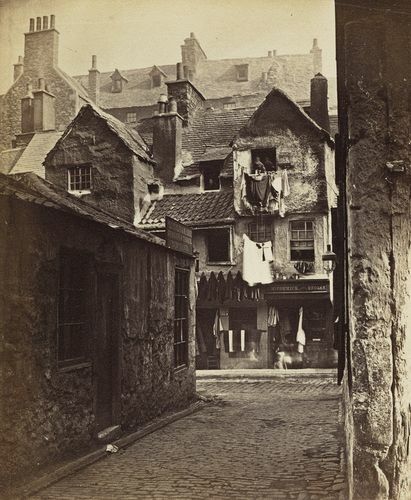 This photograph was featured in the book ‘Picturesque “bits” from Old Edinburgh’, published in 1868. It comprises several photographs by Burns alongside descriptive and historical texts by Thomas Henderson. This work highlights the typical living conditions of Edinburgh’s old town at this time – with overcrowding and poor sanitation prevalent. The scene was chosen, according to Henderson, “to show the earliest form of timber-fronted houses”. Despite acting as a documentary record, this photograph also displays a beautiful and almost mystical quality. The ghostly apparitions of figures at windows and walking along the Cowgate, creates a sense of foreboding which anticipates the demolition of these buildings following the 1871 Act of Improvement.